observations: Yesterday’s entry explained how this one came about: it’s the reference to Doris Keane in Romance – and here she is. (Though really, a shame we couldn’t find a picture of tights covered in petals and a pink wig). Cedric, the Montdore heir, is very beautiful and very camp and, though he precedes the word, gay. He must have looked a picture dressed as an opera singer. He has a keen interest in fashion throughout. Apparently, it was considered very shocking when the book first appeared that he should achieve a happy ending and not suffer or be made unhappy by his sexual orientation. In the play, the characters are allowed happiness, but not together, and at one point the hero describes the heroine thus: 'Your lips drop as the honeycomb. Your mouth is smoother than oil. But your feet go down to death, and your steps take hold on hell' – a mashup from Proverbs in the Bible, and seeming a bit excessive, though he is very upset at the time. ‘Doris Keane in Romance and a black wig’ is an example of the rhetorical device of zeugma or syllepsis. 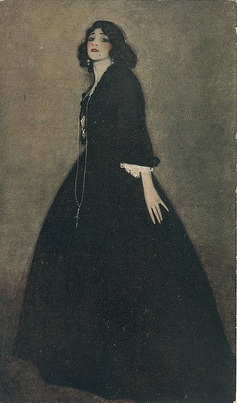 The clothes in the photo are described in a stage direction: ‘She wears a wonderful black velvet dress... around her neck is a long rope of pearls; at the end hangs a cross.’ She is also carrying a monkey, who wears green satin, diamonds, and a red turban – the actresses must have enjoyed that, while Cedric surely would have loved such an accessory. Links up with: Yesterday’s Doris Keane entry - don't miss the comment below this entry, in which a very knowledgeable reader tells all about her costumes - and explains why this is the best-known one. Fanny, and Polly, and Love in a Cold Climate have all featured before. I love this book Moira. It's years since I read it.